A delicate effort to reach a young girl buried in the rubble of her school stretched into a daylong vigil for Mexico, much of it broadcast across the nation as rescue workers still struggled in rain and darkness early Thursday trying to pick away unstable debris and reach her. The death rose after Mexico City Mayor Miguel Angel Mancera said the number of confirmed dead in the capital had risen from 100 to 115. An earlier federal government statement had put the overall toll at 230, including 100 deaths in Mexico City. 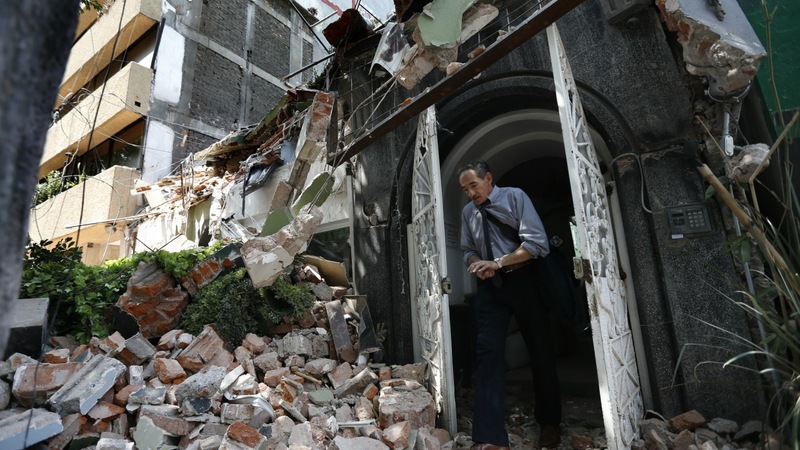 Mancera also said two women and a man had been pulled alive from a collapsed office building in the city's center Wednesday night, almost 36 hours after the quake. 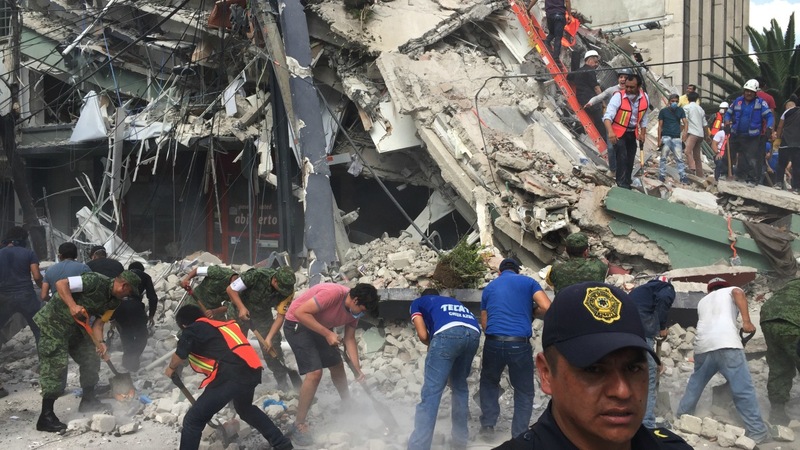 Even as President Enrique Pena Nieto declared three days of mourning, soldiers, police, firefighters and everyday citizens kept digging through rubble, at times with their hands gaining an inch at a time, at times with cranes and backhoes to lift heavy slabs of concrete. "There are still people groaning. There are three more floors to remove rubble from. And you still hear people in there," said Evodio Dario Marcelino, a volunteer who was working with dozens of others at a collapsed apartment building. In all, 52 people had been rescued alive since the quake, the city's Social Development Department said, adding in a tweet: "We won't stop." It was a race against time, Pena Nieto warned in a tweet of his own saying that "every minute counts to save lives." But the country's attention focused on the collapsed Enrique Rebsamen school on the city's south side, where 21 children and four adults had been confirmed dead. A volunteer rescue worker, Hector Mendez, said cameras lowered into the rubble suggested there might be four people still inside, but he added that it wasn't clear if anyone beside the girl was alive. 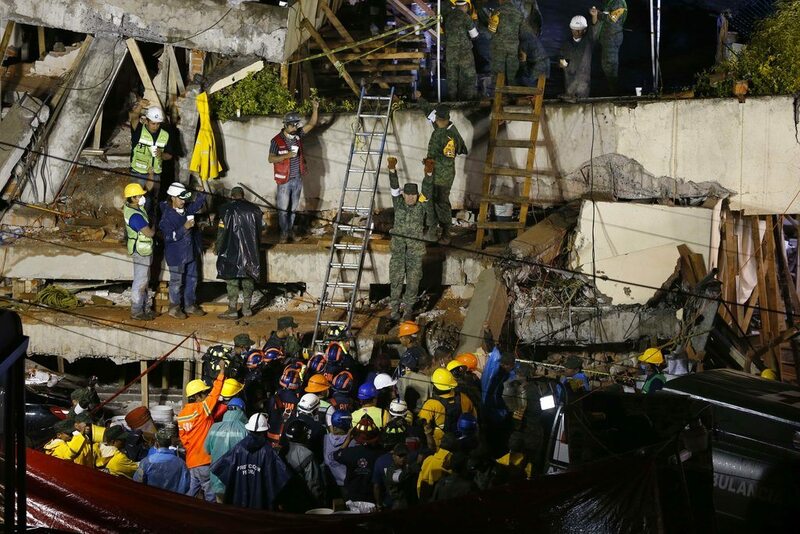 Dr. Alfredo Vega, who was working with the rescue team, said that a girl who he identified only as "Frida Sofia" had been located alive under the pancaked floor slabs. Vega said "she is alive, and she is telling us that there are five more children alive" in the same space. Education Secretary Aurelio Nuno confirmed that the girl was alive, but said it was still not confirmed if other children were also alive under the rubble. Strangely, Nuno said, no relatives of a girl named Frida could be found. While optimism ran strong for the girl's rescue effort, only four corpses had been found in the wreckage during the day, Mendez said, and workers were still trying to get to the girl as the operation crossed into a new day. People have rallied to help their neighbors in a huge volunteer effort that includes people from all walks of life in Mexico City, where social classes seldom mix. Doctors, dentists and lawyers stood alongside construction workers and street sweepers, handing buckets of debris or chunks of concrete hand-to-hand down the line. At a collapsed factory building closer to the city's center, giant cranes lifted huge slabs of concrete from the towering pile of rubble, like peeling layers from an onion. Workers with hand tools would quickly move in to look for signs of survivors and begin attacking the next layer. "There are sounds (beneath the rubble), but we don't know if they are coming from inside or if it is the sound of the rubble," Herrera said. 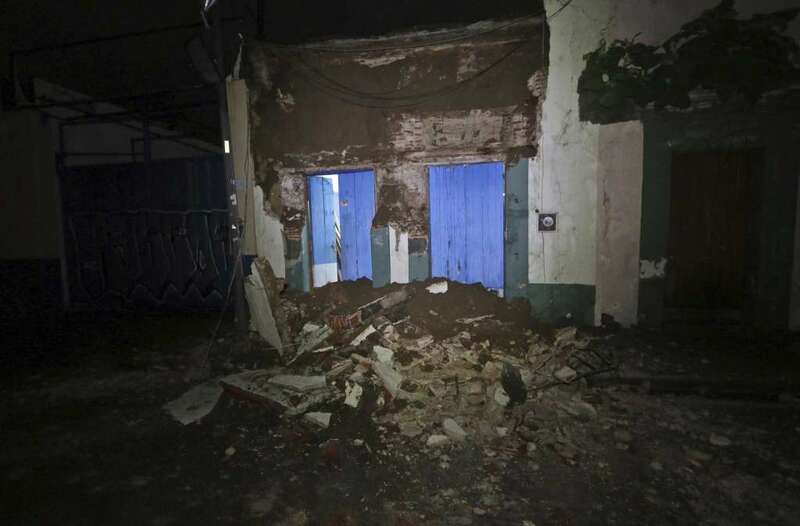 In addition to those killed in Mexico City, the federal civil defense agency said 69 died in Morelos state just south of the capital and 43 in Puebla state to the southeast, where the quake was centered. The rest of the deaths were in Mexico State, which borders Mexico City on three sides, Guerrero and Oaxaca states. In Atzala in Puebla state, villagers mourned 11 family members who died inside a church when it crumbled during a baptism for a 2-month-old girl. People at the wake said the only ones to survive were the baby's father, the priest and the priest's assistant. Power was being restored in some Mexico City neighborhoods that already spent a day without power. The mayor said there were 38 collapsed buildings in the capital, down from the 44 he had announced previously.